1. Crash Free Energy – Perhaps one of the major highlights of Optiburn Amped is its ability to support energy levels without leaving you with a crash afterwards. This is thanks to unique combination of caffeine, green tea extract and AMP Citrate. Energy is extremely important, especially if you’re trying to lose weight as you most likely aren’t eating enough calories to maintain focus, attention and motivation throughout the day. 2. Cravings Support – One of the hardest aspect of any diet is trying to fight those cravings. Whether you’re craving sweet or savoury foods, Optiburn Amped helps to suppress your appetite so you don’t feel hungry and therefore don’t even contemplate cravings. 3. Alert & Focus – Further to point number 1, there’s no point having boundless amounts of energy if you can’t remain sharp and focused. The ingredients in Optiburn Amped are supporting your metabolism whilst keeping you concentrated on the task at hand, which is diet and exercise control. Try to avoid having more than 2 serves a day. For most people, one is enough. 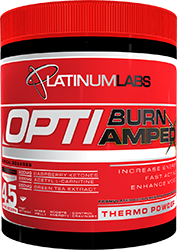 Optiburn Amped was designed to be taken once in the morning on an empty stomach, preferably 30 minutes prior to food. However, many people also like to take it in the afternoon around 3-4pm so it can double as a pre workout. Try to avoid taking Optiburn Amped too close to bedtime (~6 hours). One serving a day is ideal and is what is recommended, however, some people may want to have an extra half to a full serve. Just remember though that the supplement contains a fair amount of stimulants, so may cause some side effects if over consumed.